From the New York Tribune cable -- Since the presentations were made  a little story has leaked out which has its amusing side. There was a hot contest for the honor of offering the diamond tiara  to the Princess. Two marchionesses were the disputants, representing both sides of the great political controversy of the hour . It is an omen that the Home Ruler  won. About this folks will differ, of course, but the Prime Minister's wife  had to give place to the celebrated Maria, Marchioness of Ailesbury . The present seems to have been suggested by the dowager, who also collected the subscriptions. Apart from this, her age and position in society naturally pointed her out as a suitable person to head the deputation. On the other hand, the Marchioness of Salisbury conceived that the wife of the Prime Minister had the right of precedence in such matters, and pushed her claim. When the ladies themselves , fearing to give the offering a political complexion, wisely decided against Lady Salisbury, there was much tragic rage in a quarter which I need not more specifically mention; the more that Maria of Ailesbury is an ardent admirer of Mr. Gladstone, and have we not been told by Lord Salisbury himself that Tories who respect themselves do not hold converse with the right honorable gentleman? 1. That is, the presentations of silver wedding anniversary gifts to the Prince and Princess of Wales (later King Edward VII and Queen Alexandra of the United Kingdom). They celebrated 25 years of marriage on March 10, 1888. 2. The tiara in question is Queen Alexandra's Kokoshnik, Made of diamonds set in white and yellow gold, the tiara was a gift to Alexandra from a group calling themselves the "Ladies of Society." 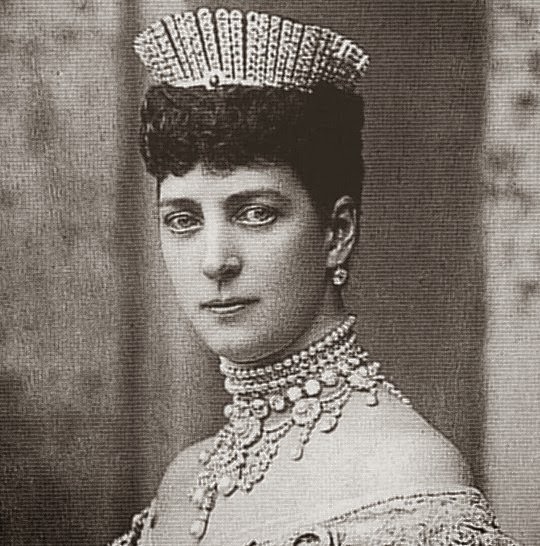 They raised the money to have Garrard make the tiara for Alexandra, who suggested that she'd like a kokoshnik tiara much like the one worn by her sister, Empress Marie Feodorovna of Russia. 3. The political controversy in question was "Irish Home Rule" -- i.e., whether or not Ireland should be governed on domestic matters (at least in part) by a legislative body located in Ireland. Ireland had had its own parliament until 1800, when the Act of Union abolished it. The issue of Home Rule was one of the flashpoints that eventually led to the Irish War of Independence and the establishment in 1922 of the Irish Free State -- but of course, questions about who should govern Northern Ireland persisted (often violently) throughout the 20th century and continue to be debated today. 4. 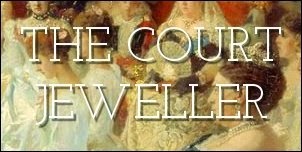 Two women from the "Ladies in Society" group competed for the opportunity to present the new tiara to Alexandra. One was Lady Salisbury, the wife of the current prime minister (the 3rd Marquess of Salisbury). The other was Maria, Lady Ailesbury, who had taken a leadership role within the committee. Maria's late husband, the 2nd Marquess of Ailesbury, had been a member of the Liberal Party, which was headed by William Ewart Gladstone. Under Gladstone, the party supported Home Rule for Ireland. Salisbury's Conservative party staunchly opposed Home Rule. Maria, the "Home Ruler," won the dispute and presented the tiara. 5. Georgina, Lady Salisbury (1827-1899), nee Georgina Alderson, was the wife of the 3rd Marquess of Salisbury. He was Britain's Prime Minister in 1888. Georgina's father, Baron Alderson, had been an influential judge and Baron of the Exchequer. 6. Maria, Lady Ailesbury (1813-1892), nee Lady Mary Herbert, was the wife of the 2nd Marquess of Ailesbury. Maria's father was the 11th Earl of Pembroke; her mother was Countess Catherine Semyonovna Vorontsova, who was the daughter of the Russian ambassador to Britain. 7. That is, the other members of the "Ladies of Society" committee.